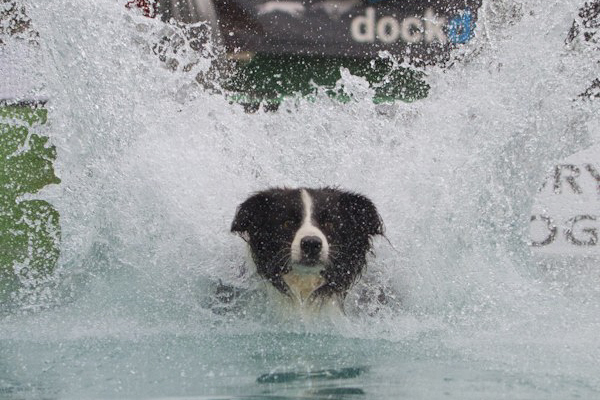 Dock Dogs is a relatively new sport to Australia, first seen at the World Dog Games in Sydney in 2008. It involves dogs jumping off a dock, into a pool, with different games testing different skills. The three games are Big Air, Extreme Vertical and Speed Retrieve. Big Air: Essentially long jump for dogs, Big Air or “BA” involves the dogs running and jumping off the end of the dock as far as they can as the handler throws a toy. 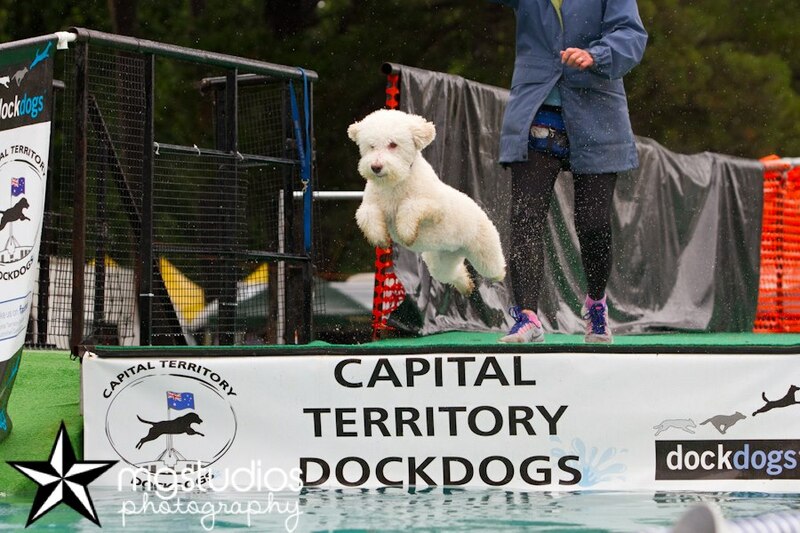 The measurement of how long the dog jumped is taken from where the base of the tail hits the water, the area of the body which would usually hit the water first. Longest jump wins. The current world record is now over 30 feet! Extreme Vertical: Extreme vertical or “EV” is essentially high jump for dogs. A toy (bumper) is suspended 8” out and 4’6” high off the dock and the dogs are encouraged to jump to grab the bumper before landing in the water. Dogs are eliminated from competition if they can’t reach the height of the bumper. Each round, the height of the bumper is increased by 2 inches until only one dog remains. The current world record stands at nearly 9 foot high. Speed Retrieve: In the Speed Retrieve “SR” game, the bumper is suspended a few inches above the water at the end of the pool. Handlers line their dogs up on the dock at the 20 foot mark, just behind an infrared beam. Like flyball, SR uses drag lights to signal the handler to release the dog. The timer begins when the green light comes on and any false starts result in disqualification. The speed retrieve uses elements of both BA and EV as the higher and further the dog jumps, the faster they will be able to get to the bumper. Pulling the bumper away from its holder, breaking the magnetic bond stops the clock. Fastest time wins! The current world record for SR is now under 5 seconds. Another event, called “Iron Dog” exists which collates the dogs’ highest scores from each of the events to find an overall winner. The winner is the dog with the highest number of points!